In Honor of Make a Difference Day, the largest national day of helping others, Lakeside Bank hosted a special “Women Who Make a Difference” Awards Reception on Tuesday, Oct. 18th, and gathered employee volunteers for a day of service at the Chinese American Service League (CASL) in Chinatown on Saturday, Oct. 22nd. 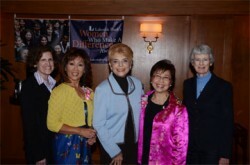 At the awards reception, emceed by ABC7 Chicago news anchor Linda Yu, Lakeside Bank and over 150 women guests honored two customers, Allison Salke and Bernie Wong, who make a difference in their communities. Allison Salke is CEO of Gordon & Co., a Massachusetts broker-dealer. In her time outside the office, she serves on the Fenway Health Board of Directors. As Board Chair, she recently led Fenway Health during one of its most challenging periods of growth: the conclusion of an $18 million capital campaign and construction of a $65 million, 100,000 square foot health center in Boston. Her leadership was instrumental in completing that massive undertaking on schedule and within budget, and her experience navigated the organization through the complicated financing opportunities and tax credits. Fenway Health is a Boston based community health center which serves more than 17,000 patients a year in three locations regardless of their ability to pay. Serving in various capacities on Fenway’s Board, Allison has used her financial expertise to help the organization build a positive operating margin for the past few years, despite increased costs of providing access to health care and the continuous decline of state and federal support. Bernie Wong is the founder and President of the Chinese American Service League (CASL), the largest and most comprehensive social service agency for Chinese Americans in the Midwest. Under Bernie’s leadership, CASL has grown from a one-person shop in 1978 with an annual budget of $30,000 to $12 million. She spearheaded the initiative to build a $6.7 million Senior Housing facility as well as CASL’s new facility, the Kam L. Liu Building. Prior to her work with CASL, Bernie served as Director of Social Services for a community center and a Head Start Day Care Program in a predominantly African American community. Bernie is universally lauded as a leader in the Asian community both in Chicago and nationwide: she chaired the Chicago Mayor’s Advisory Council on Asian Affairs both under Mayor Harold Washington and Mayor Richard M. Daley; was the first Asian appointed to the Boards of United Way of Chicago and the Chicago Public Library; was a member of the Governor’s Asian Advisory Council, the only Asian member of the Human Relations Task Force sponsored by the Chicago Community Trust and formerly served on the Leadership of Greater Chicago Board and the Chicago Transit Authority’s Citizens Advisory Board. Visit www.makeadifferenceday.com for more information.